1. What are warp and weft? Answer: Warp is the lengthwise threads on a loom-usually vertical to you, the weaver. Weft are the crosswise threads, horizontal to you, the weaver, usually put in with a shuttle. On little looms, you can wrap the warp all at once and then weave the weft, like a traditional loom with harnesses. This can be done on the Loomette, Jiffy Loom and Lightning Weaver. OR you can wrap half the warp, half the weft and the second half of the warp, then needle-weave the second half of the weft. This is how you weave on the Weave-It and Weavette Looms. 2. Where can I find the old looms you talk about? Answer: eBay, thrift stores, antique malls, estate sales, garage sales. 3. I only have the loom. Where can I find instructions and needles? Answer: Basic loom instructions are in the free PDF manual downloads on the Looms page of this site. Additionally, most of the pattern booklet PDFs on the Projects page have warping and weaving instructions included. Regular 5"-6" weaving needles are available in sewing notions of most retailers. Extra-long weaving needles may be found at www.lacis.com and www.upholsterystuff.com (on this page). 4. Do you sell looms and equipment? 5. Can I build my own loom? 6. I don’t have a loom or know how to make one, but want to start right now! How? Answer: Foamcore and round-headed straight pins! 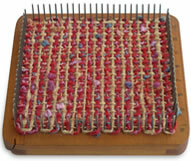 Mark a square on the board and put the same number of pins on each side-about 6 to 8 per inch to begin with. Starting at a bottom corner, lace the warp back and forth from bottom to top, around each pin in turn. Then needle weave back and forth through the warp, going around the side pins in turn. Take the pins out-voila! Personally, I find that hitting the board underneath with my needle is really annoying, but hey, it’s cheap and it’s a start. It’s also very flexible since you can change the pin arrangement at will. 7. I like making the squares but don’t like putting them together. Do you have any suggestions for me? Answer: Start small. Don’t make an afghan or rug for your first project. Try a Loom Bloom or a bag or hat. You may learn to like the finishing as much as weaving. If you really have a stumbling block at the assembly process, form a partnership with a fiber artist who WANTS to turn your weaving into something. Try quilters, sewers, jewelers, crocheters, knitters and felters. I wish I had an elf to weave the pieces I need to bring all of my ideas to fruition! 8. Why haven’t I heard of these looms before and why aren’t they more popular? Answer: Fiber crafts are cyclical. In the 30’s, these looms were hot! In the 70’s, weaving, spinning, crochet, macramé, knitting and quilting saw renewed interest. Knitting has come roaring back again in the last few years, followed by crochet (which had been stagnating since the 70’s). I have hope for little looms, especially as fiber artists become aware of their versatility.